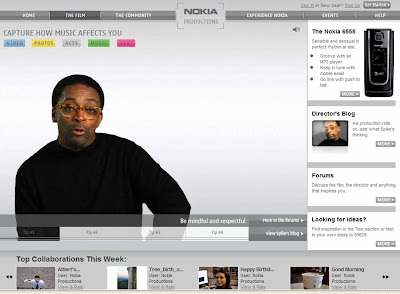 Nokia and Spike Lee to produce a collaborative UGC film about music! Spike Lee has been signed by Nokia to encourage people to “express mobile creativity in a massively collaborative film about music”. All details can be found on the website at www.nokiaproductions.com. The final film will be made up from content that Nokia users have created with their mobile phones and will be put together by Spike Lee. Humanity is our central theme. Think about its meaning and how music tells our story. Over the course of production, there will be three Acts for you to interpret. Shoot a photo or video that reflects the Act. Produce a soundtrack to enhance someone’s Act. Text in ideas for others to go out and film. Upload your work and if you want, edit in other people’s submissions to create a full Act. Vote for your favorite Acts. The winners will appear in the next Spike Lee Joint." However, whilst I like the Nokia Spike Lee partnership, my favourite example of this user generated / music video collaboration idea is actually from the Beastie Boys way back in 2004! The concert documentary that they made "Awesome; I F**kin' Shot That!" looks even more impressive when viewed in the context of how media and music has developed in recent years. In October 2004 the Beastie Boys gave video cameras to 50 members of their concert audience in different parts of Madison Square Garden and encouraged them to film as much footage as they could. The end result was a 6,372 cuts which band member Nathaniel Hornblower (Adam Yauch) then painstakingly edited and spliced together to create a highly innovative Beastie Boys concert film - way before User Generated Content entered the mainstream (more here). This is a good indicator of how quickly technology has changed in a short space of time. The Beastie Boys had to distribute Hi8 cameras, whereas Nokia's collaborative Spike Lee project can have a far wider range of contributors as users can now produce high quality video via their mobile phones!